For many people, that first cup of coffee in the morning is the only way to start the day. But coffee has also become a vital part of the rest of the day — as an aid to digestion after meals, as a pick-me-up at work, or simply as a special treat at the end of a shopping trip. Coffee is equally revered in every country, but the ways in which it is enjoyed are often completely different. In the past few years, typical Italian cafes, cool American coffee shops, and cozy Viennese coffee houses have spread their coffee culture and established a cult around this everyday beverage. Coffee probably originated in Abyssinia (now Ethiopia) and presumably takes its name from the Kaffa province there. Coffee cultivation moved from Africa to Yemen, which soon supplied coffee to the entire Arab world. 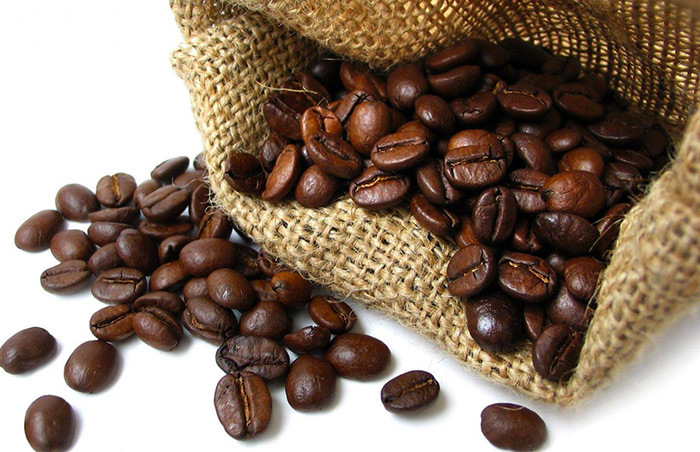 At the beginning of the 17th century, the first coffee beans were brought to Italy from the Yemeni port city of Mocha. With the siege of Vienna by the Turks in 1683, coffee began its triumphal march through all of Europe. When the Turks retreated, they left behind hundreds of sacks of coffee. A clever Viennese took advantage of the opportunity and immediately opened the city’s first coffee house. At first, coffee was rare and expensive, and was therefore reserved for the aristocracy. To meet the large demand, colonial powers established plantations in all suitable, subtropical areas. But coffee didn’t become a drink for the common people until the arrival of the new industrial age, when the methods for processing coffee were simplified and the luxury drink became slightly more attainable. Today, coffee is mainly grown in the “coffee belt” along the 28th parallel, where ideal conditions for coffee growing prevail: A hot and humid climate with a constant temperature from 17 to 23°C, without the danger of frost even at high altitudes. 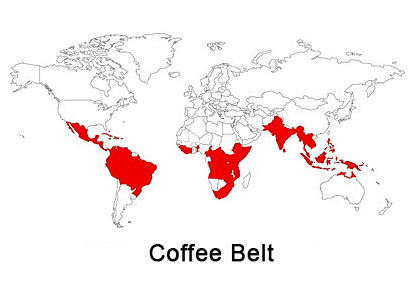 The world’s largest coffee producers are currently Brazil, Colombia, and Indonesia. Two varieties of coffee plant have endured through the ages and are the most commonly available today: Coffea Arabica and Coffea Robusta. What is the difference between Arabica and Robusta coffee beans? Arabica coffee is less acidic, contains less caffeine, and has a finer, milder, sweetish flavor. Of course Robusta is the converse. The name “robusta” is related to the word “robust”, which reflects the coffee’s powerful flavour, which is more bitter and has less body than the more complex Arabica coffee. Robusta coffee is more bitter, more acidic, has less aroma, and more caffeine than Arabica. Arabica beans grow on shrubs in wet tropical areas that have an annual average temperature of around 21° C (70 F). It thrives in altitudes from 2600 to 6500 feet, but is unfortunately highly susceptible to pests and frost. The largest producers of Arabica beans are Brazil and Columbia, where they grew in areas of around 3000 feet altitude. 70 percent of the world’s commercially produced coffee beans are Arabica. Robusta plants, as their name implies, are more resilient but only grow at altitudes from 980 to 2600 feet. The majority of robusta beans are produced in Vietnam, Indonesia, West Africa, and parts of Brazil. Robusta beans are cheaper than Arabica beans, because they grow more quickly and can be harvested more often. Robusta beans can be harvested within 2-3 years of being planted. Arabica beans require 4-5 years. Robusta beans can also be grown in a wider variety of climates, so there is more potential competition amongst coffee farmers. Gourmet coffees usually consist of 100% Arabica coffee. Cheaper coffees may be blends of Arabica and Robusta, or 100% Robusta. I personally enjoy both, they are different, but both have their place! Coffee beans are actually the seeds of a cherry-like fruit that grows on the coffee tree. Each fruit contains two seeds enclosed in a parchment skin that must be removed. There are two methods for removing the skin: The “dry” method, in which whole fruits are dried until the beans can be hulled; and the more complex “wet” method, in which the beans are squeezed out of the hulls in a washing process and then re-washed and dried. The practically colorless and odorless coffee beans must then be roasted. This is where each variety takes on its own specific flavor and aroma. The difference is in the temperature and duration of roasting. For example, espresso beans are roasted the longest. The basic principle is always the same: hot water is poured over the roasted and ground beans. But at this point, minute differences enter into the picture, starting with the type of grind. Coffee always tastes best when freshly ground. It should not be stored for very long and only in tightly sealed containers. A medium grind is used for normal filter coffee; Turkish coffee requires a powdery grind; whereas, Italian espresso is slightly coarser. Whether you prepare your ground coffee using a manual filter, French press or stove top espresso maker, with the Turkish method or a machine, depends on your particular tastes. We at BravoCooking.com love coffee in all its varieties, flavours, and aromas. As lovers of coffee we hope to share that enjoyment with you.